D.N.B, MD - Medicine, M.B.B.S. Dr. Manish Mahajan, M.B.B.S, M.D. (Medicine), DNB(Neurology) is a Consultant Neurologist at Mukat Hospital, Chandigarh. Prior to that, he had worked as a Consultant at the Institute of Human Behaviour & Allied Sciences, New Delhi. 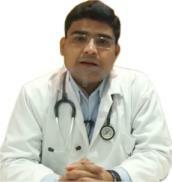 Dr. Manish is an alumnus of Government Medical College, Patiala where he completed his undergraduate medical studies. Then he did house jobs & residency at Government Medical College & Hospital, Sector 32, Chandigarh. Thereafter, he accomplished his post graduation in Internal Medicine from Sardar Patel Medical College, Bikaner in the year 2009 and attained DNB(Neurology) from the prestigious institute Sir Ganga Ram Hospital, New Delhi in 2014. To his credits, he was bestowed with a Bronze medal in Pharmacology during his graduation & the prestigious A. K. Sehgal Award for being the best resident in Neurology at Sir Ganga Ram Hospital, New Delhi. Apart from this, he has contributed his research work in various peer- reviewed journals and actively participates in conferences & workshops of his professional domain.